The Arecaceae is a very large family of 225 genera and 2600 species of tropical woody xerophytic monocotyledons. While Palms aren't succulent, they are often grown by collectors of cacti and other succulent plants. Most species have unbranched trunks or stems crowned with large fan (palmate) or feather (pinnate) leaves but there are a few clumping palms. The fruits are usually indehiscent nuts, berries or drupes. The fossil record for Palms extends back at least 80 million years from the present day into the late Cretaceous. The Arecaceae are of great commercial importance as sources of nuts, edible fruits, starchy foods, oils, fibre, thatch and woods and have been cultivated for thousands of years. Palm trees include many important agricultural plants including Coconut (Cocos nucifera,) Date Palm (Phoenix dactylifera,) Oil Palm (Elaeis guineensis,) True Sago Palm (Metroxylon sagus) and Rattan (Calamus sp.) Betel nuts (Areca catechu) are chewed throughout much of Asia for the intoxicating effect of alkaloids in the nuts, a significant cause of oral cancer among users. e.g. Cabbage Palm, Palm Lily (Cordyline sp. 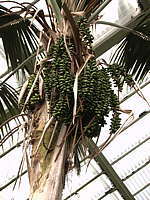 ), Pony-Tail Palm (Beaucarnea recurvata). 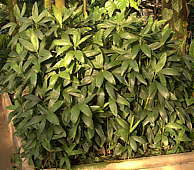 The succulent Aroid Palm (Zamioculcas zamiifolia) is a Philodendron. Several plants commonly known as Sago Palms are Cycads (e.g. 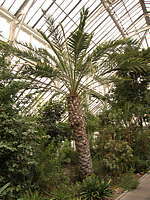 Cycas revoluta). Traveller's Palm (Ravenala madagascariensis) from Madagascar is in the Bird of Paradise Family Strelitziaceae. 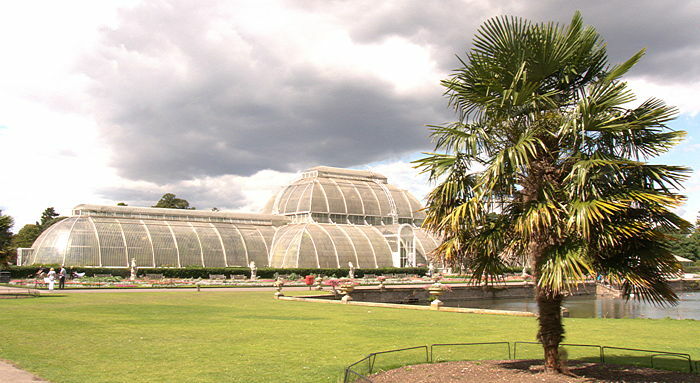 A large collection of Palms can be seen at the Royal Botanic Gardens, Kew, especially in the Palm House. 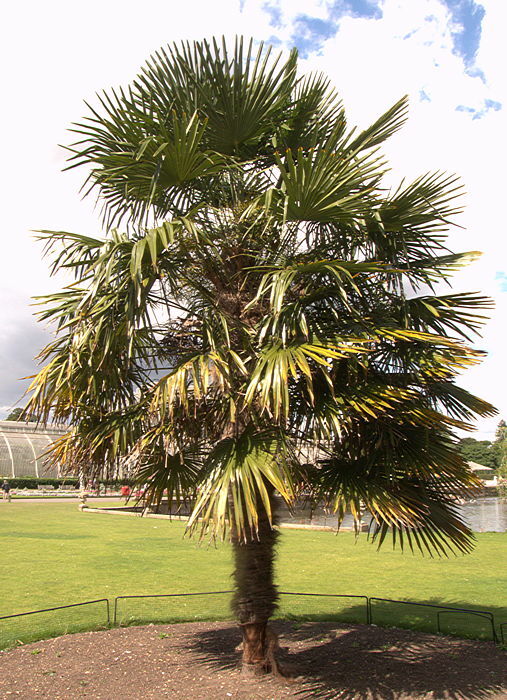 This genus includes about 50 species of palm trees with single stems, native to tropical India, Malaysia, Southern China, Phillipines, the Solomon Islands and Australia. Crown shafts are often brightly coloured. 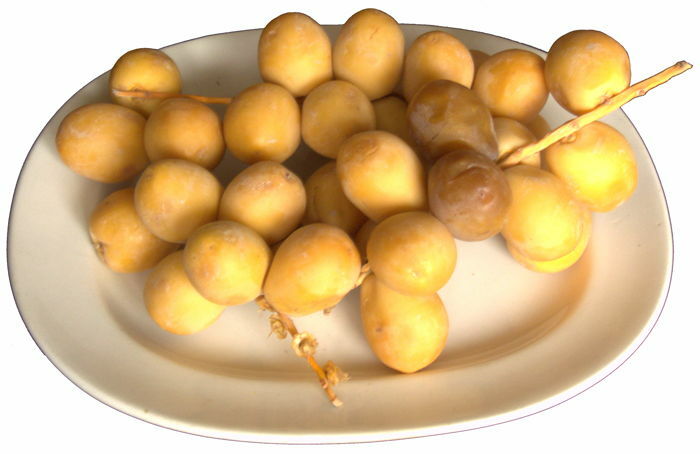 Several species of Areca produce nuts with a bitter taste, chewing of which is popular in South-East Asia. 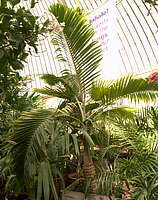 Areca catechu is the best known palm tree in the genus Areca. The slender trunk ringed with leaf scars reaches a height of 100ft, but more commonly 50ft, and is crowned with a cluster of large pinnate leaves. The fruit is an orange egg shaped nut containing a single hard seed. 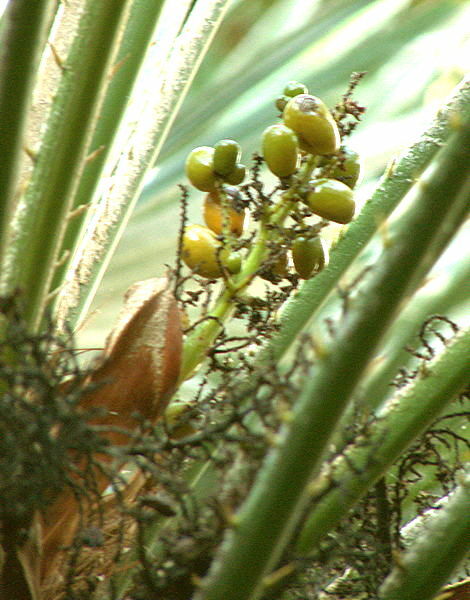 As with many cultivated plants, the exact origin of the Betel Nut Palm is obscure but probably Malaysia or the Philippines. Betel nuts (pinang) are commercially important. The nuts, often together with betel leaf from the vine Piper betle, tobacco and lime, are chewed throughout much of Asia for the intoxicating effect of alkaloids (Arecaine, Arecoline) in the nuts. Chewing betel nuts stains the teeth red and is a significant cause of oral cancer among users. However, the alkaloid Arecoline has anthelmintic properties (against parasitic worms). This colourful slow-growing palm tree has a crownshaft and petioles ranging in colour from red to bright orange. Both male and female flowers are produced on the same plant. The clusters of small yellow-orange to yellow-green flowers are followed by clusters of yellow or orange fruits. Grows up to 20ft tall. Native to the Moluccas Islands near to the coast of Indonesia and requires constantly moist soil, warmth and shade. Not frost hardy. Name: Brazillian common name for palms in this genus. 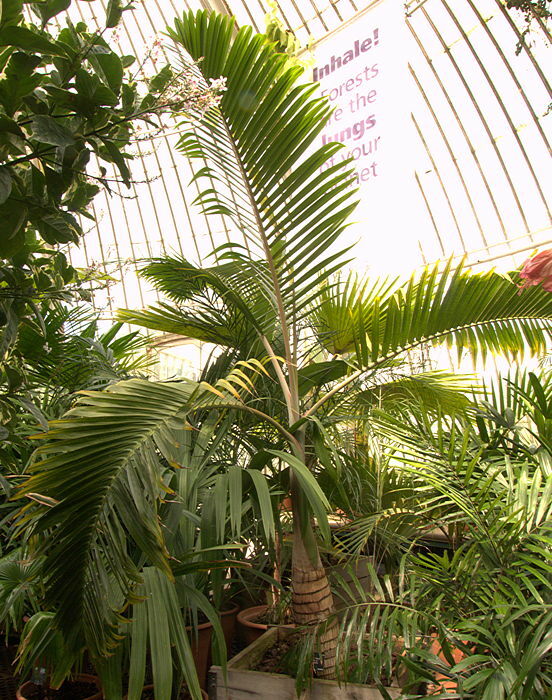 The genus Butia includes 20 South American palms with feathery foliage from Argentina, Brazil, Paraguay and Uruguay. Members of this genus range from 4ft to over 30ft tall. The edible fruits are used as the base to make alcoholic beverages and conserves. 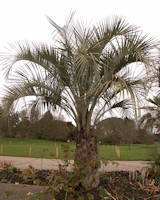 Butia capitata has a solitary, stout trunk covered with persistent leaf bases and supporting feathery, pinnate, blue-green leaves with sharp spines along the petioles. It is a slow grower but given time will grow to about 20ft tall. The yellowish fruit are edible with a sharp, sweet fruity flavour. Native to Argentina, Brazil and Uruguay. This is the hardiest Butia, tolerating -10°C, and can be grown outdoors in milder parts of Great Britain and other warm temperate regions. 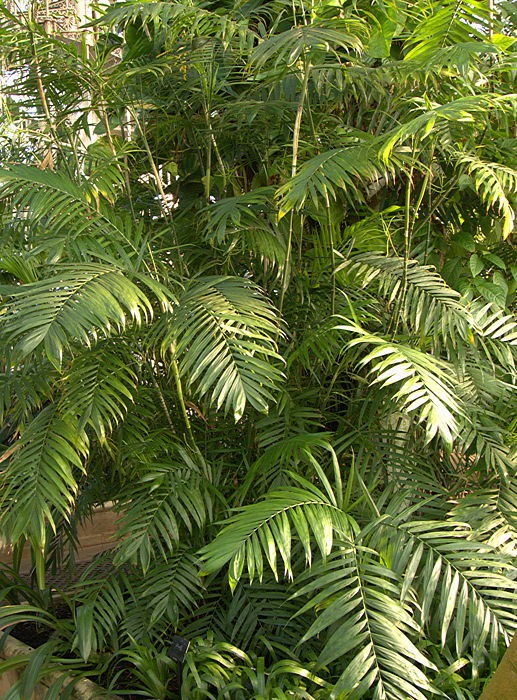 The genus Chamaedorea includes 107 species of small to medium-sized palms with slender bamboo-like stems. They often spread though subsurface or surface stolons to form clumps. This genus is found in Central and South America, usually as understory plants. Leaves are pinnate. The inflorescence is produced below the leaves, with male and female flowers on separate plants. Female flowers are followed by orange to dark red or black drupes which are toxic and should not be eaten. 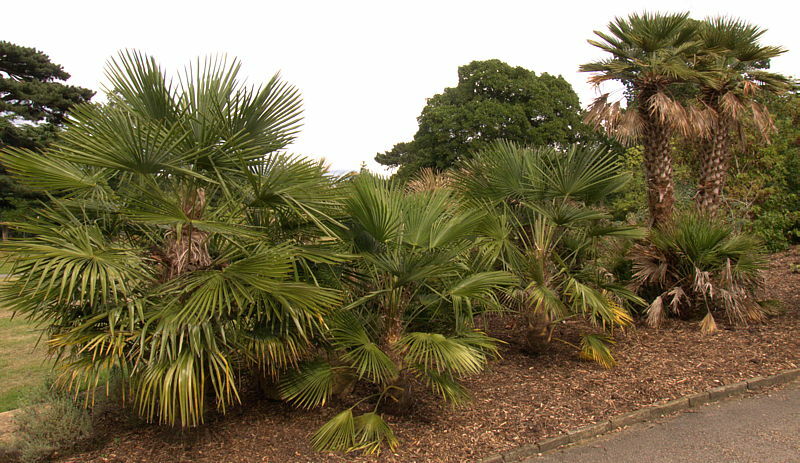 Only a small number of palms from this genus are cultivated commercially. 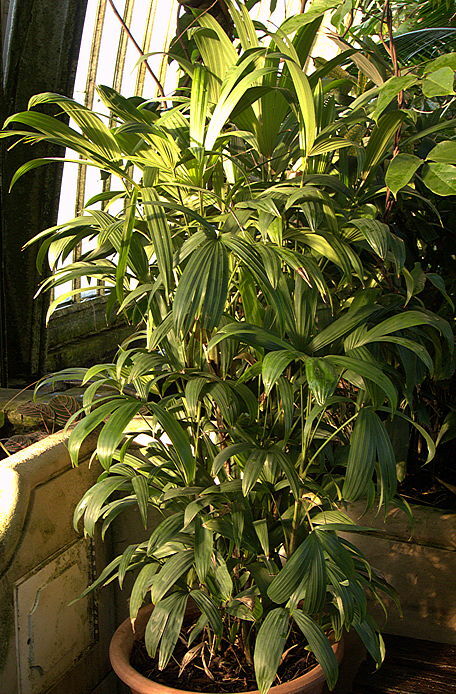 Chamaedorea elegans (Parlour Palm) is widely grown as a tolerant houseplant. 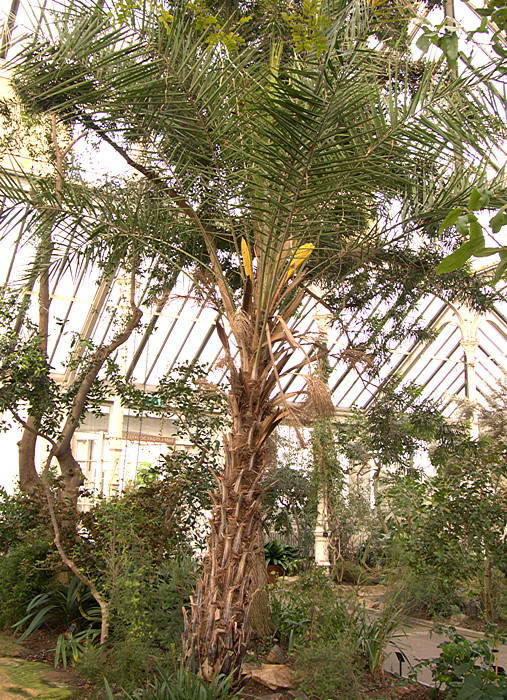 Although shown free-standing here, this palm is a climbing species, albeit one without spines. However the upper leaves on the long, thin green stems up to 20 ft long, are reflexed to hook themselves to supporing vegetation. The stems clump up through stolons. Native to rain-forests of Central America. 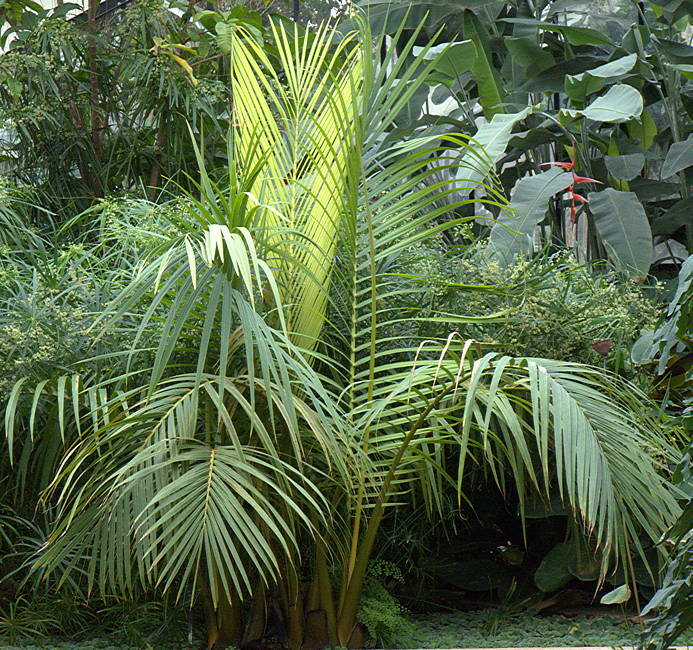 This slow growing palm has a slender green stem up to 8 ft tall, topped with a whorl of broad, simple silvery-grey leaves with a metallic lustre and bifurcated tips. A less common form has compund leaves with lanceolate leaflets. A branched orange inflorescence is produced from the lower leaves, followed by small black fruits. Native to humid forests at modest elevations along the South-Eastern coast of Mexico, where it grows as an understory plant. Being tolerant of shade, it does well as a house plant. May tolerate light frosts. This clumping palm has thin, green 10ft stems bearing pinnate leaves with many lanceolate leaflets and a feathery appearance. Native to Mexican rainforest in the states of Sinaloa to Oaxaca, where it grows from sea level up to 6600 ft. This clumping palm has thin (1cm), green 10ft stems bearing 3 - 6 pinnate leaves with many well-separated lanceolate leaflets. The branched inflorescence is followed by a cluster of black fruits which are toxic. Native to a range from Southern Mexico into South America where it grows in forests as an understory plant. A variety formerly known as C. erumpens has much wider leaflets. has slender 4 ft stems with annular leaf rings. The dark-green bifid leaves have serrate margins. This species spreads by stolons to form a dense clump. 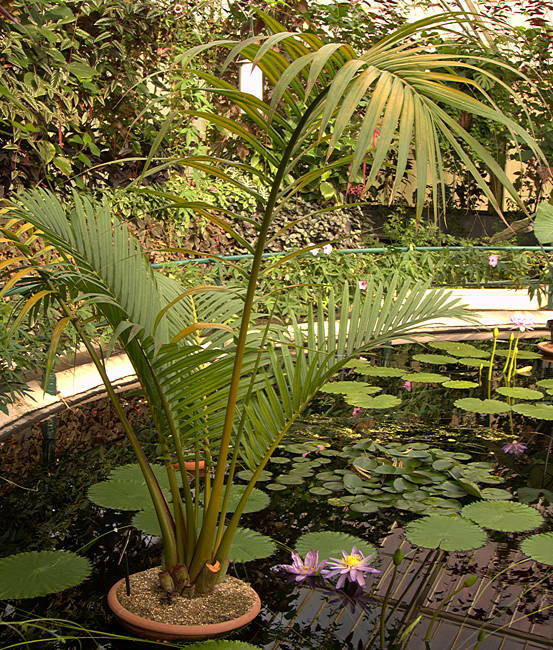 Male and female flowers are on separate plants, but male plants are rare in cultivation. Native to South-Eastern Mexico where it grows as an understory plant on limestone. Tolerates slight frost and has the potential to become invasive. This is one of the larger members of the genus, growing as a solitary plant or occasionally suckering to form a clump. 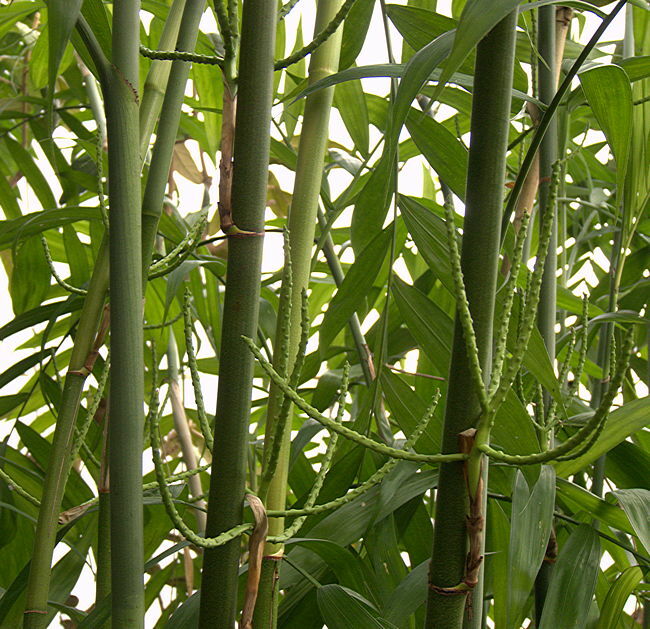 The slender green stem grows over 20ft tall. The petiole has a prominent longitudinal yellow stripe on its under side and supports a feathery pinnate leaf. 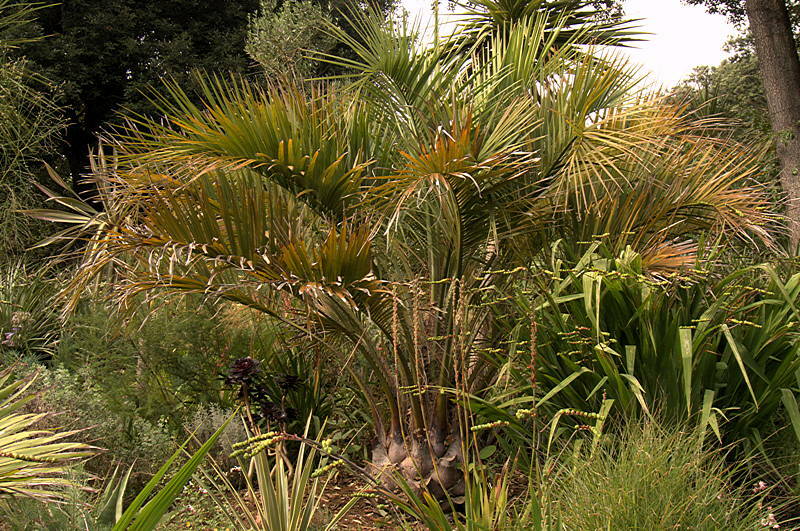 The genus Chamaerops is monotypic for Chamaerops humilis (Dwarf Fan Palm, European Fan Palm). 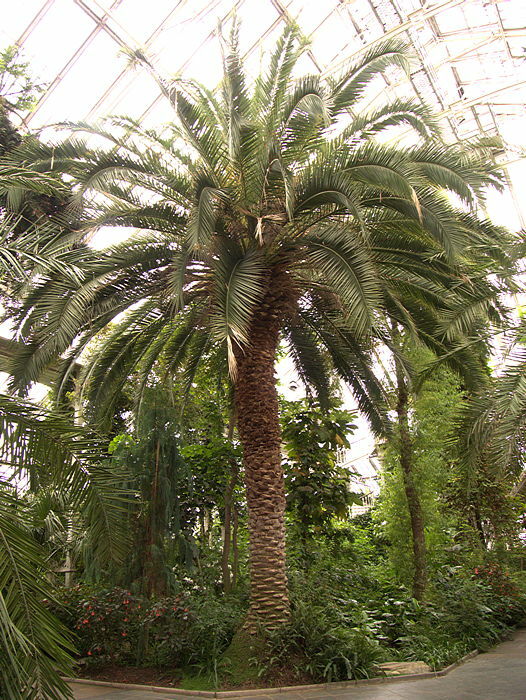 This genus is closely related to the Asian genus Trachycarpus except that Chamaerops offsets freely at its base while Trachycarpus remains as a solitary stem. 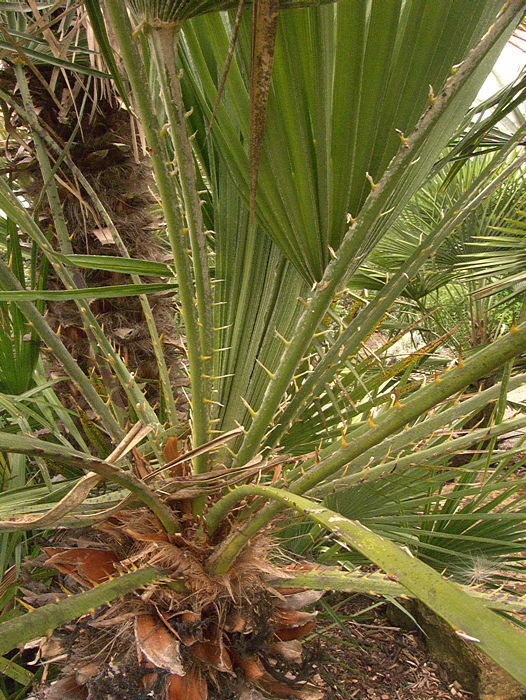 Chamaerops have spiny petioles whereas those of Trachycarpus have two rows of very small teeth. 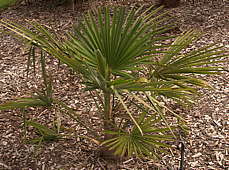 This palm is a shrubby plant, often with several stems growing from the base of a mature plant. The stems are decorated with persistent leaf bases and felted with fibrous material. The ends of the stems carry a cluster of fan-shaped leaves on a long, spiny petiole. Each leaf is composed of many 2ft leaflets and varies in colour between different plants from blue-green to grey-green to yellow-green. 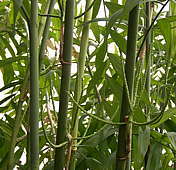 The leaves are used in basket weaving and other crafts. The inflorescence is a short cluster of small bright yellow flowers carried close to the stem ends, often but not always with male and female flowers on separate plants. The flowers are pollinated by a specific weevil, attracted by a perfume, uniquely produced by the adjacent leaves. Flowers are followed by small yellowish, fibrous fruit each containing a single seed. The fruits are bitter and inedible. 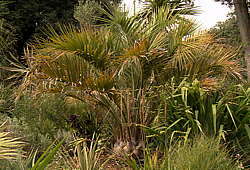 Chamaerops humilis is native to continental South-Western Europe including France, Italy, Malta, Portugal and Spain, North-West Africa including Algeria, Morocco and Tunisia. Its hardyness, salt resistance and ability to resprout after fire are considered important in stabilising the poor sandy soils typical of its habitat. It is widely grown as an ornamental plant elsewhere including Great Britain where it is hardy to -10°C, except in the most exposed locations. Sadly, an introduced South American moth Paysandisia archon is threatening its survival. This genus includes two species of palms from South-East Asia: C. hainanensis and C. nana. 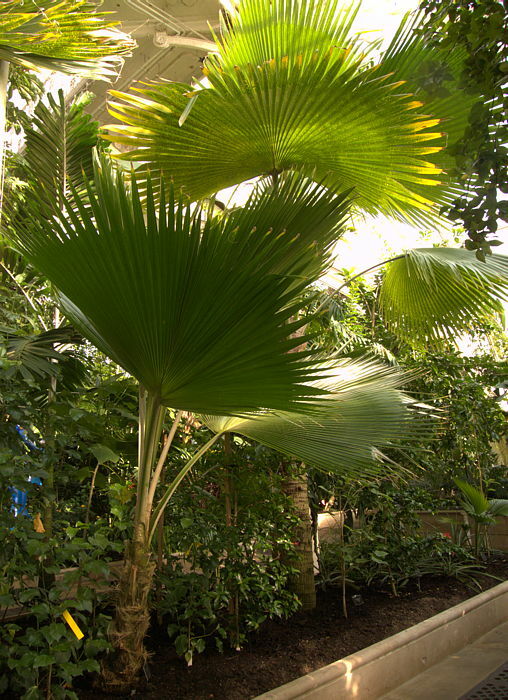 This small 4ft palm has slender 1 in diameter canes with deeply divided fan leaves. It spreads by suckering. Flowers are hermaphrodite and are followed by clusters of small orange fruits. Native to China and Vietnam. Chuniophoenix nana does well in a pot and is a good subject for a cool conservatory. is a much larger plant with 6 in diameter stems 12 - 15ft tall. Native to China. 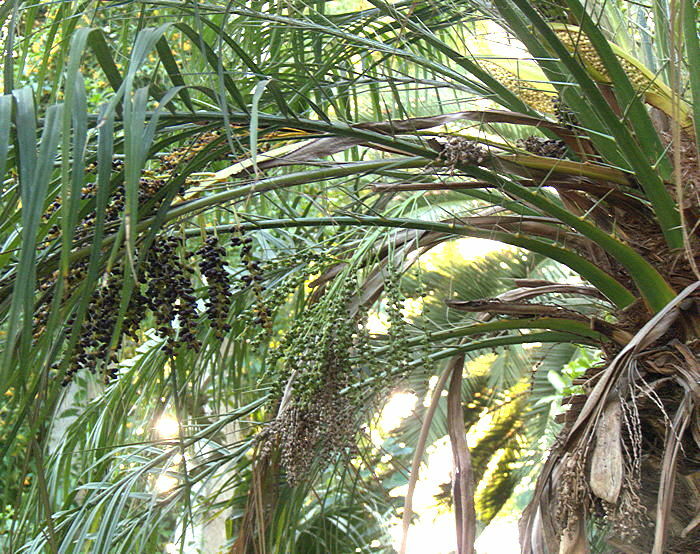 The genus Howea includes two species of palm tree, both from Lord Howe Island, located 370 miles East of Australia. The smooth trunks are marked with leaf scars and bear a crown of large pinnate leaves. There is no crownshaft but the leaf sheafs persist for a while as a mass of fibre around the trunk. Named for: William Forster (1818-1882), Senator and Premier of New South Wales. The green trunk with circular brown leaf scars grows up to 50 - 60 ft tall. It bears a crown of 10ft long arching pinnate leaves with droopping leaflets. 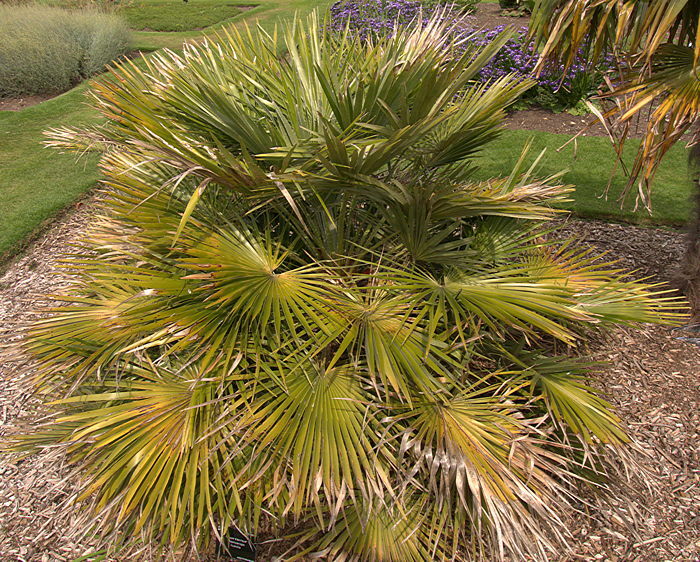 Howea forsteriana is sufficiently hardy to survive outside in South-West England but is happier in a Mediterranean climate. 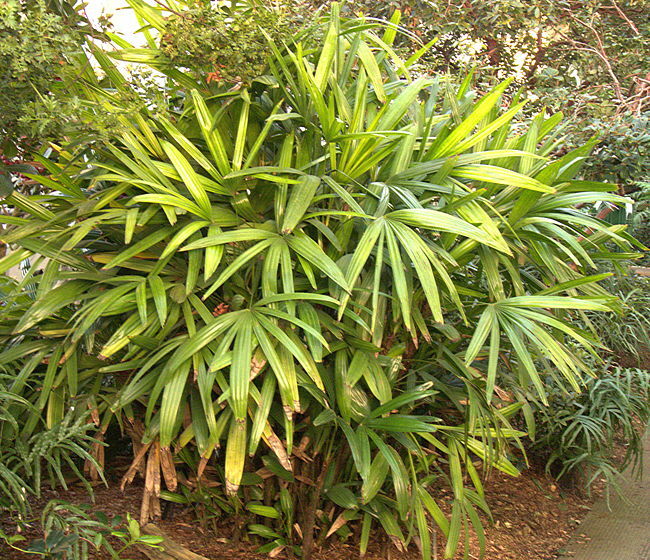 is a smaller related palm up to 20 ft tall with a crown of smaller 5 ft leaves with erect leaflets forming a v-shape. It is mainly found at higher elevations, up to 1500 ft above sea level, than H. forsteriana although the two species both occur in lowland areas. 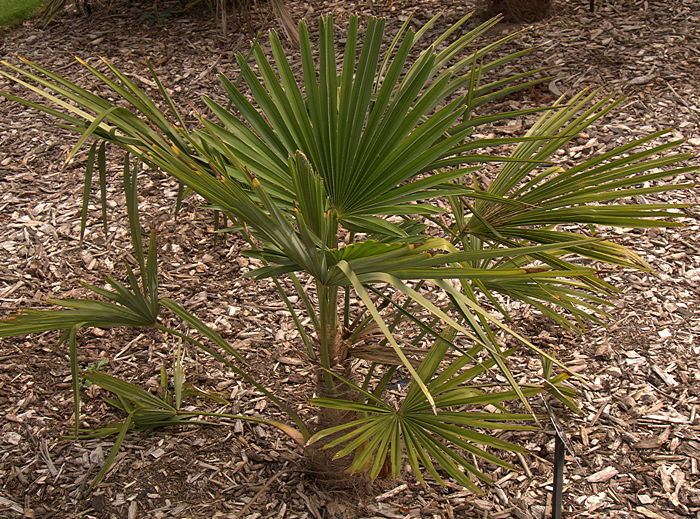 The genus Hyophorbe includes 5 species of palm trees from the Mascarene Islands in the Indian Ocean. Two of the species Hyophorbe lagenicaulis (Bottle Palm), Hyophorbe Verschaffeltii (Spindle Palm) are critically endangered in their habitat but are likely to survive through widespread cultivation as architectural plants. 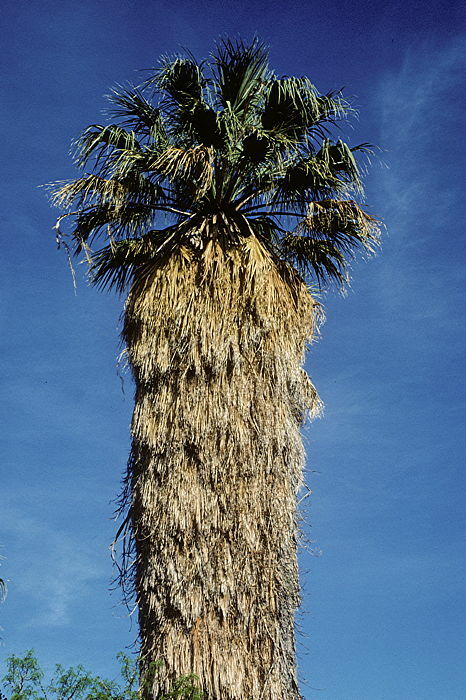 This slow-growing palm tree develops a swollen, smooth grey lower trunk marked with ring scars. The trunk has the appearance of a bottle when young, but the bulge becomes less dramatic with age. The crown-shaft is bright green and is topped with four to six arching, pinnate leaves. Male and female flowers are produced on the same plant. The inflorescence of white flowers is produced from the base of the leaves and is followed by large oval green fruits, ripening to black. Hyophorbe lagenicaulis is native to the Indian ocean islands of Round Island where the species is critically endangered, and Mauritius Island where it survives in parks and gardens. 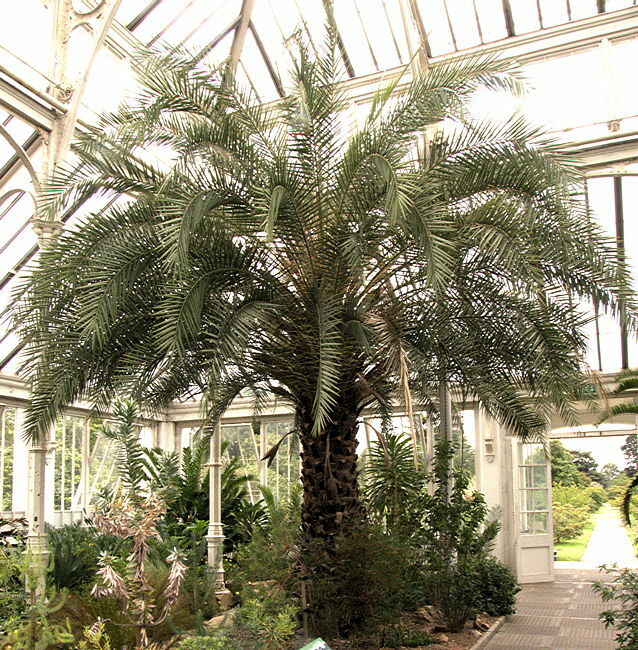 Survival of the Bottle Palm is ensured through widespread cultivation as its sculptural form makes a fine specimen plant for a conservatory. Despite appearances, the swollen trunk does not store water and frequent watering is required. 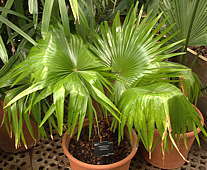 This Palm is cold sensitive and will not tolerate any but the lightest frost which will damage the foliage. has a trunk with slender ends and a swelling in the middle, just below the blue-green crown-shaft. 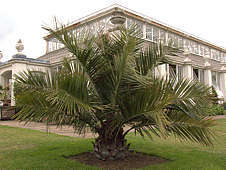 The genus Jubaea is monotypic for Jubaea chilensis, the Chilean Wine Palm. The massive grey trunk tends to taper towards its base and crown giving a swollen appearance. The trunk supports a crown of 40 - 50 blue-grey, pinnate leaves which fall off cleanly after dying. 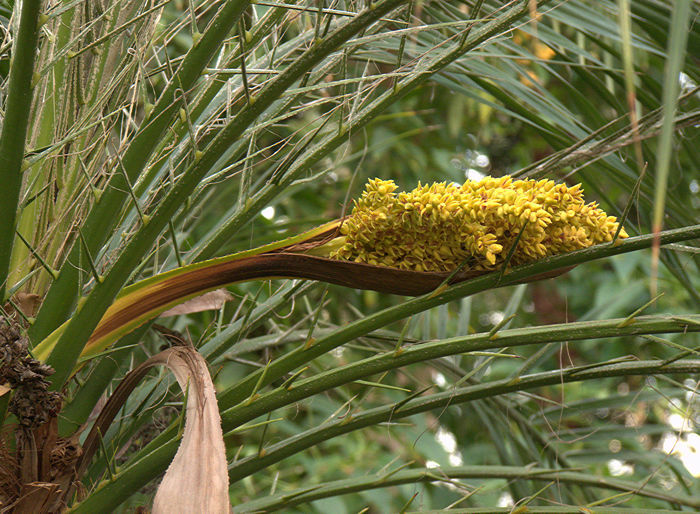 The inflorescence includes both male and female flowers and is followed by edible yellow-brown spherical hard-shelled nuts from which an edible oil can be extracted. Top left, right This splendid 55 ft specimen in the Temperate House, Royal Botanic Gardens, Kew, was grown from a seed planted in 1846. 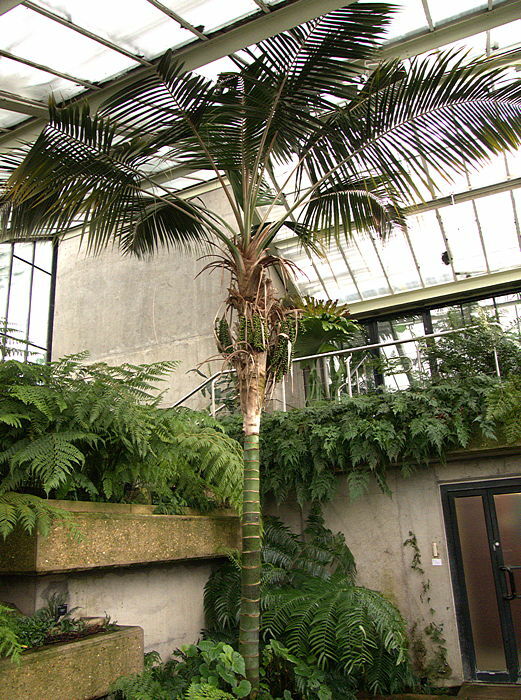 It is claimed to be the tallest indoor plant in the world. 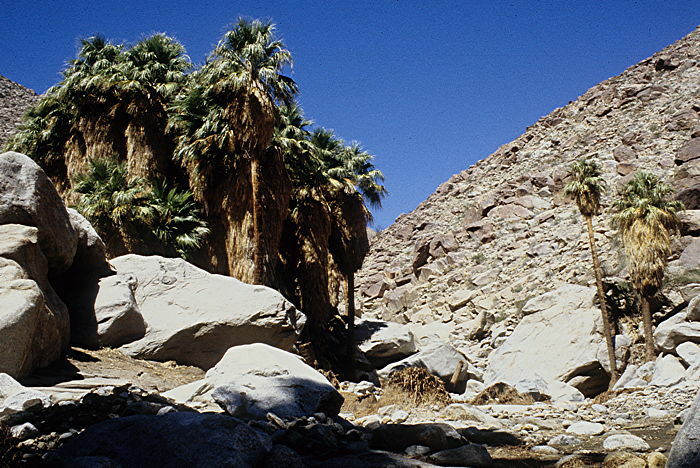 Jubaea chilensis has the potential to reach at least 90ft in height. Lower left: A younger specimen showing the crown of large pinnate leaves which are used in Chile to make baskets. This palm was planted in 1982 by H.M. Queen Elizabeth II. The common name refers to use of the sap boiled down into a syrup (palm honey) or fermented into a beverage (palm wine). The sap was obtained by cutting down the tree, removing the crown, placing the trunk on a slope and allowing the sap to drip out of the cut end, producing as much as 90 gallons over a few months. As a result of this practice, wild populations are somewhat depleted and endangered. Above: a small Jubaea chilensis outside the Temperate House, Royal Botanic Gardens, Kew. August 2011, & same plant wrapped for Winter 2010. This relatively hardy palm tree is endemic to a small area of central Chile, growing in steep ravines at elevations up to 4,600ft. Best suited to a Mediterranean climate, but tolerates a small degree of frost and does not require heat to grow. 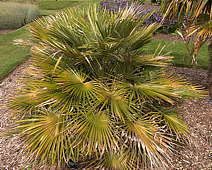 Chilean Wine Palms may be sufficiently hardy to survive in mild parts of Britain and other temperate climates where frosts are not severe. 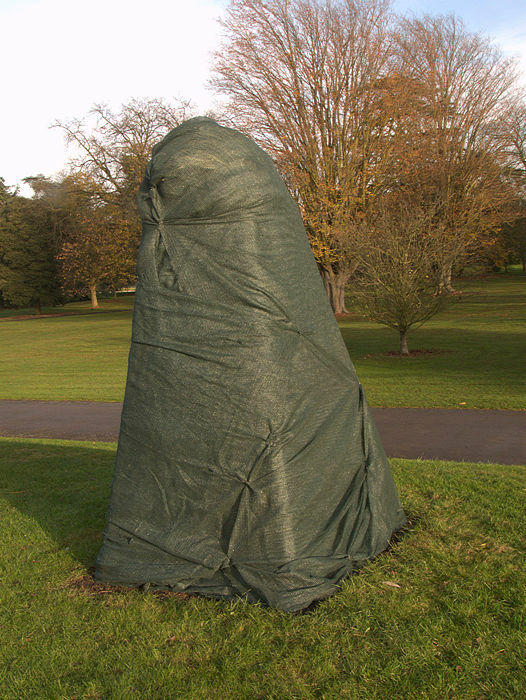 A small specimen may be wrapped in a protective fleece. 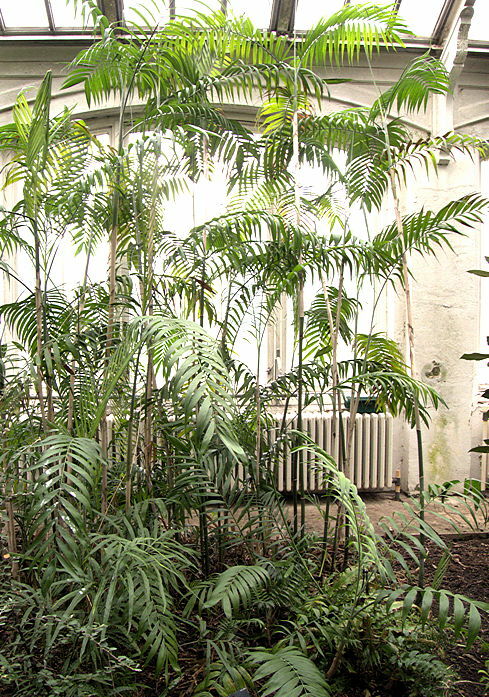 Named for: Patrick Murray, Baron of Livistone whose home and collection are the present Royal Botanic Garden, Edinburgh. 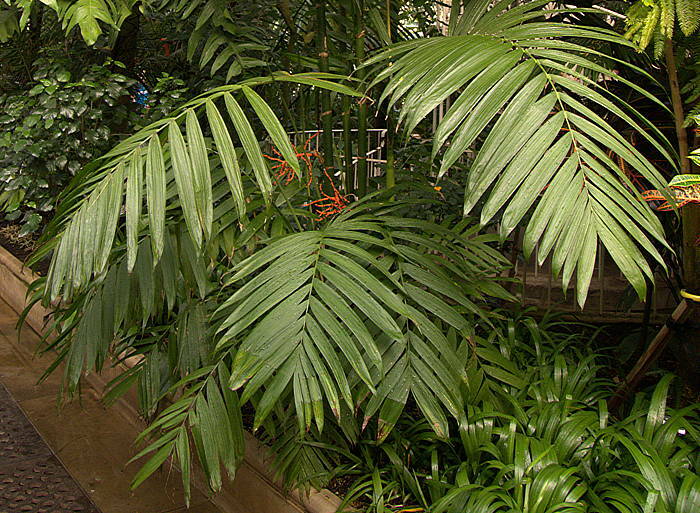 The genus Livistonia includes 36 species of fan palms. The leaves have spiny petioles supporting a rounded fan of many leaflets. The unusually small fruits are produced in grape-like clusters, often blue or jade-green. Members of the genus are found in South-Eastern Asia, Australasia, the Horn of Africa and Arabia. Livistonia palm trees are commonly used for landscaping. The leaves are used for thatching and wrapping food. 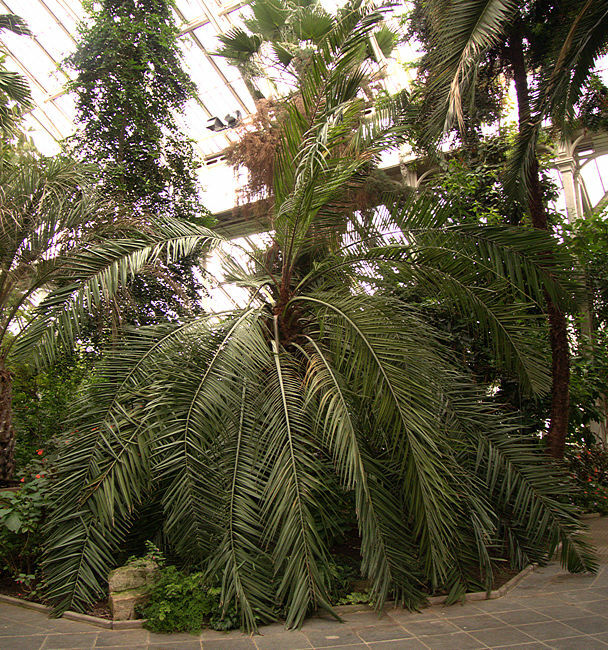 This solitary palm grows up to 30 ft tall with a crown of large fan-shaped leaves, deeply divided into segments which droop distinctively at their ends. Flowers are followed by large clusters of small blue fruit. Native to Southern Japan, Taiwan and the Ryukyu Islands. The seeds were traditionally used to treat cancer. Livistona chinensis subglobosa has a dwarf growth habit. This palm tree has a solitary slender trunk up to 80ft tall with prominent leaf scar rings and covered with fibrous material near its tip. 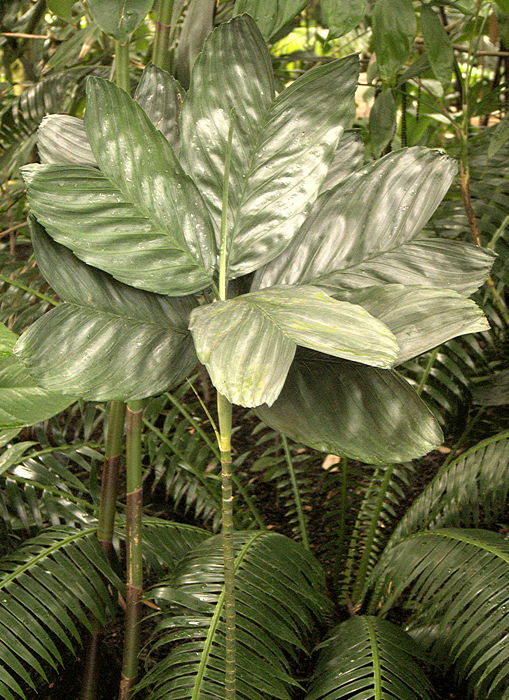 The rounded shiny leaves with incompletely separated leaflets become more divided as the plant matures. The inflorescence is a 6ft panicle of small yellow flowers followed by clusters of 1 inch diameter spherical red fruits, ripening to black. Livistona rotundifolia is native to tropical rainforests of Malaysia, Indonesia, Maluku Islands and many Philippine islands and requires some heat and humidity to grow well. In its native area, leaves are used for thatching and wrapping food and have become the unofficial national leaf of the Philippines. 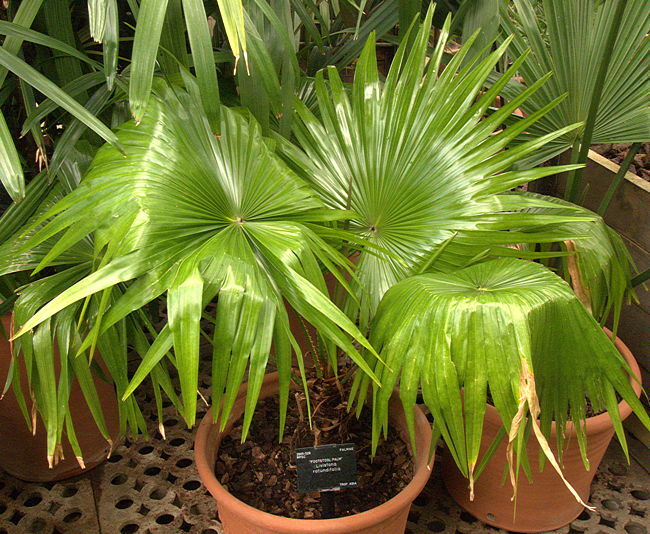 Livistona rotundifolia is commonly planted in landscaping and grown as a tolerant indoor pot plant. This genus is monotypic for the South-East Asian palm Nypa fruticans. 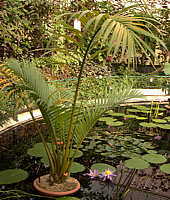 A thick rhyzome, creeping underground or below the surface of water, produces up to six pinnate leaves up to 30ft long. The petioles are unarmed. Both male and female flowers are produced on a single plant, the male flowers resembling yellow to red catkins. The globular inflorescence of yellowish female flowers is followed by a ball-like cluster of woody nuts, which when ripe split up and fall into the surrounding water as a method of distribution. Nypa fruticans is native to India, Ceylon and South-East Asia though the Malay Archipelago into North-Eastern Australia (Northern Territory, Queensland). 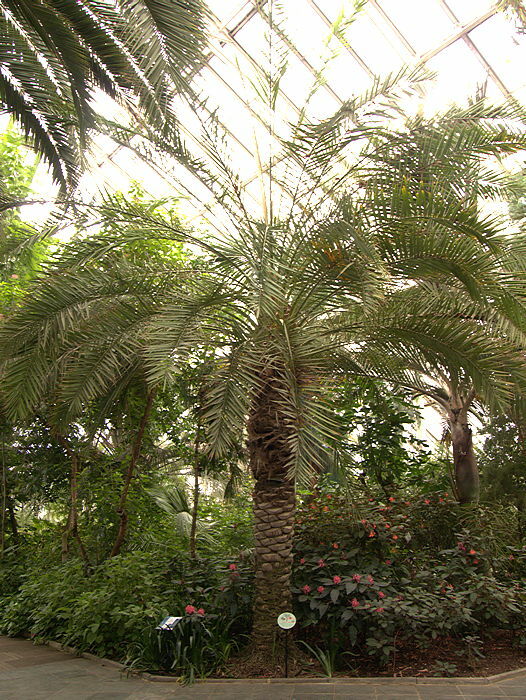 This palm has been introduced into West Africa where it has become invasive. Nypa fruticans typically grows in brackish water of tidal estuary flood plains, spreading by way of tidal distribution of its floating seeds. It tolerates fresh water but will not grow in undiluted sea water and hence can not be considered a true Mangrove. In cultivation, this is definitely a plant that likes its feet wet at all times. The sugary sap can be tapped as a source of molasses or fermented to alcohol or vinegar. Various parts are used in traditional medicine and the tissues contain anti-hyperglycemic substances. The leaves and stems are used as a source of fibre for weaving or thatching. Nypa fruticans is recognisable in the fossil record, with specimens in 60 to 70 million years old Paleocene deposits and possibly earlier. Its fossil pollen is distributed worldwide, including London clay. Its fossilised nuts are found in Dorset. The genus Phoenix includes 13 species of palm trees from Mediterranean Europe and the Canary Islands, Africa and Asia. Nine species have suckering trunks forming clumps, while the remaining four are solitary. The stout trunk carries a crown of pinnate leaves with lower leaflets metamorphosed into long, vicious spines (acanthophylls). The inflorescence is a large branching panicle of small yellowish-brown flowers. The fruit is a drupe with a single elongated, deeply grooved seed. 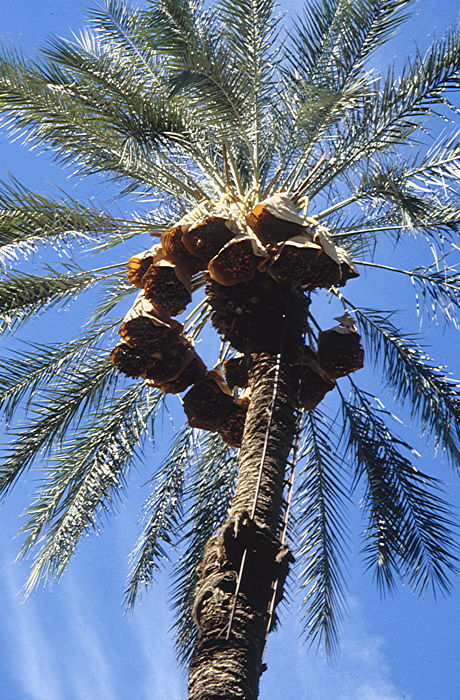 In most species there is only a thin layer of pulp around the seed but Phoenix dactylifera produces fruit with thick, sweet fruit pulp, the commercially-important date. 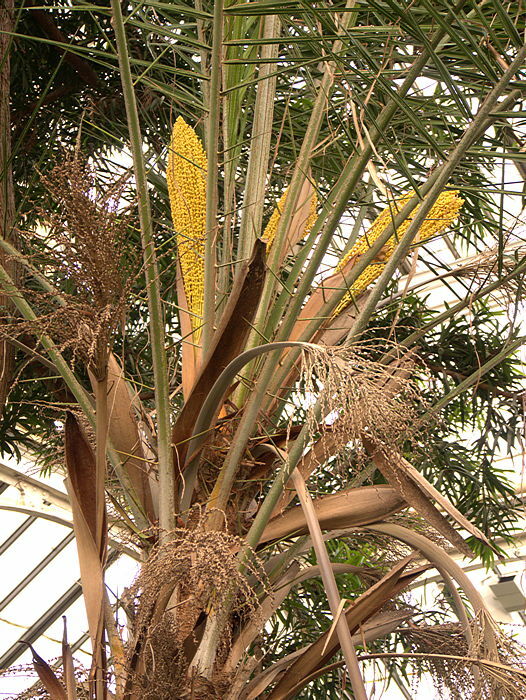 Phoenix dactylifera has been cultivated for thousands of years. 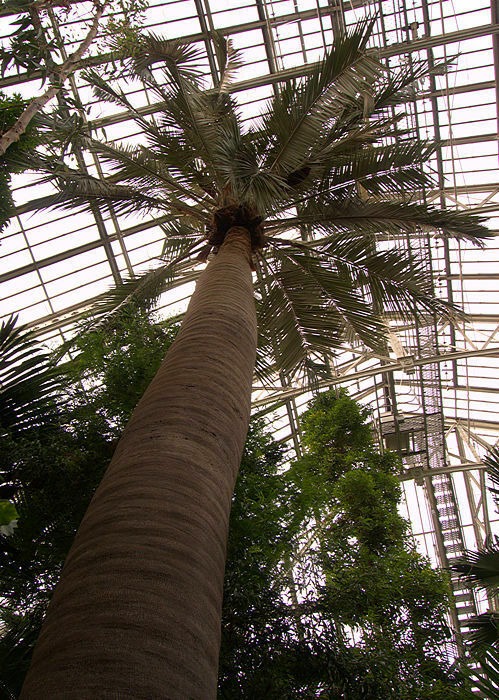 This large solitary palm tree can grow 130ft tall but is often seen smaller. The trunk is crowned with a cluster of large feathery pinnate leaves up to 20ft long with up to 100 leaflets either side of the central midrib. Lower leaflets are spiny. The inflorescence is a panicle of small creamy flowers (male) or yellow-orange (female) with male and female flowers on separate plants. The yellow-orange oval fruits contain a single large grooved seed surrounded by fruit pulp that is too thin to be worth eating. Phoenix canariensis is native to the Canary Islands where it is a national symbol. The sap is used there to make palm syrup. The Canary Island Date Palm is widely used as an ornamental plant in countries with warm and Mediterranean climates, even growing in Ireland and Southern England as it will withstand occasional mild frost. 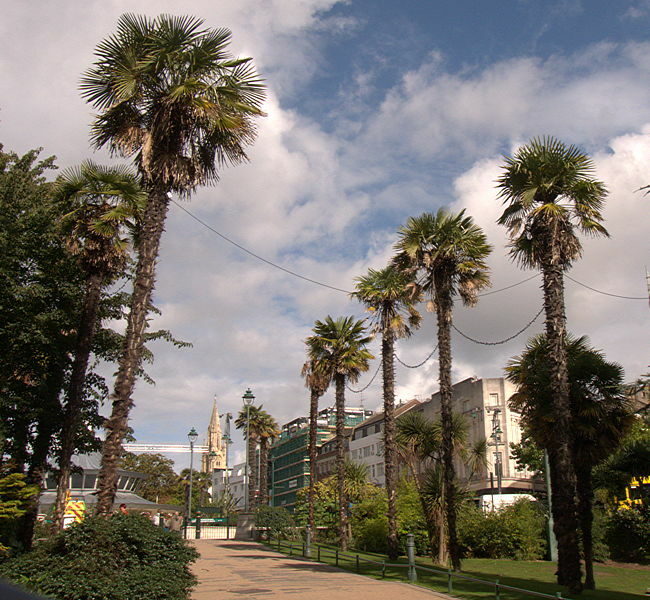 In warm countries Phoenix canariensis may be an invasive plant. 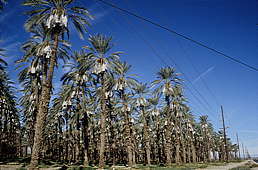 The Date Palm is a multi-stemmed tree from which basal suckers are generally removed, to create a single-stemmed tree capable of growing up to 100ft tall. The trunk, patterned with leaf scars is crowned with a cluster of pinnate leaves up to 20ft long, the central midrib of which has V-shaped ranks of leaflets up to 2ft long along its length. 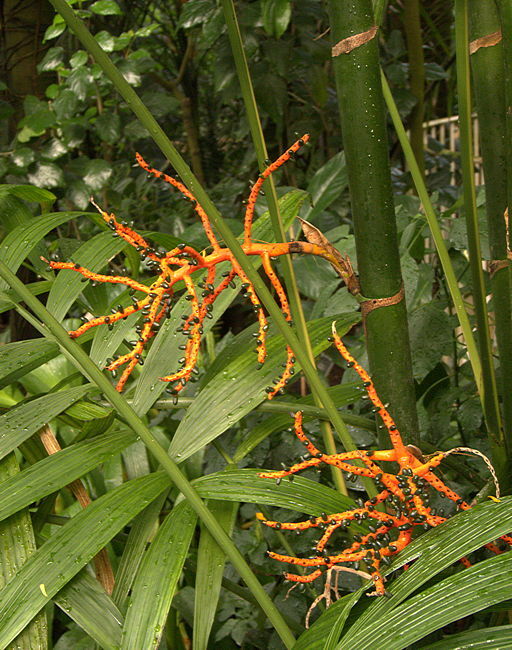 Near the base of the leaf stem, the leaflets morph into 4 inch spines. The inflorescences are hanging panicles of small, white, fragrant flowers with male and female flowers on separate plants, probably pollinated by wind. Flowers are followed by yellowish-brown fruit, dates, with a single large grooved seed surrounded by sweet pulp. A single date palm can produce 50kg of nutritious fruit every year, an important staple food in North Africa and the Middle East, and is said to have 800 uses besides. Phoenix dactylifera is native to North Africa, but at least 8000 years of cultivation has obscured its exact origin, which may have been around the Persian Gulf. Doubtless human selection of trees producing the best fruit has improved the species. Many distinct varieties are grown commercially in Iraq, North Africa, Palestine and in the South-Western USA, especially Southern California and Arizona. In many places the South-Western desert is giving way to palm groves irrigated by scarce ground-water. 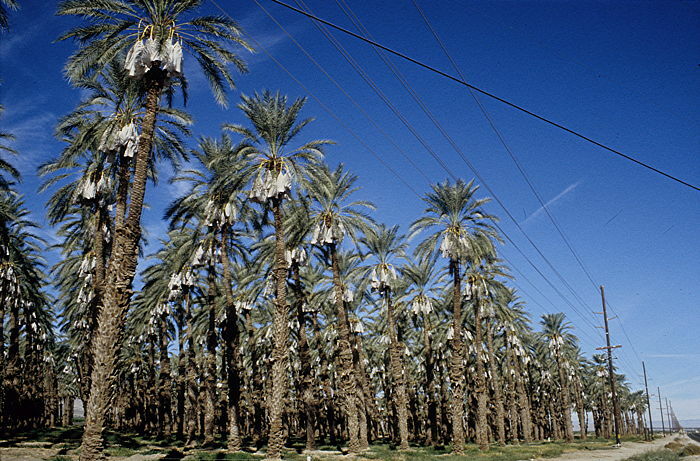 Under these conditions, salts accumulate in the soil and the salt-tolerance of palms is an asset. Phoenix dactylifera has little frost resistance although brief, light frosts may be tolerated. No dates are produced in the absence of high temperatures. 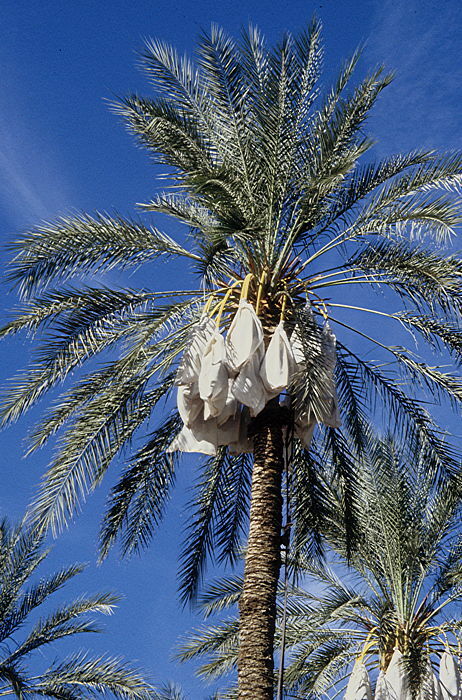 In humid climates the date crop is of poor quality and tend to fall from the tree prematurely. Humidity makes the foliage susceptible to leaf spot and other fungal diseases. Phoenix dactylifera plantation by US 86. Paper bags are used to protect the developing fruit against rain and birds. Name: Latin reclinata = bending down, referring to the arching leaves. Phoenix reclinata has slender, leaning stems up to 40ft tall, with a crown of feathery pinnate leaves up to 15 ft long. 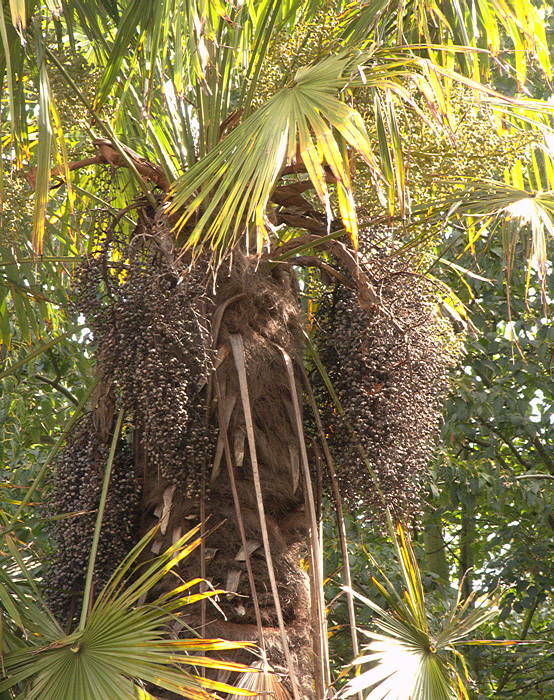 This palm clumps up by suckering at the base to form a tangled thicket of stems and leaves. 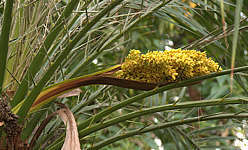 The branching yellow sprays of flowers are followed by edible small orange-brown fruits on the female palms. Native to a range from the Eastern Cape of South Africa to Egypt, usually along river banks or in wet ground. It is listed as invasive in e.g. Florida. Named for: German orchid collector Carl Roebelen (1855-1927) who discovered this palm in Laos. 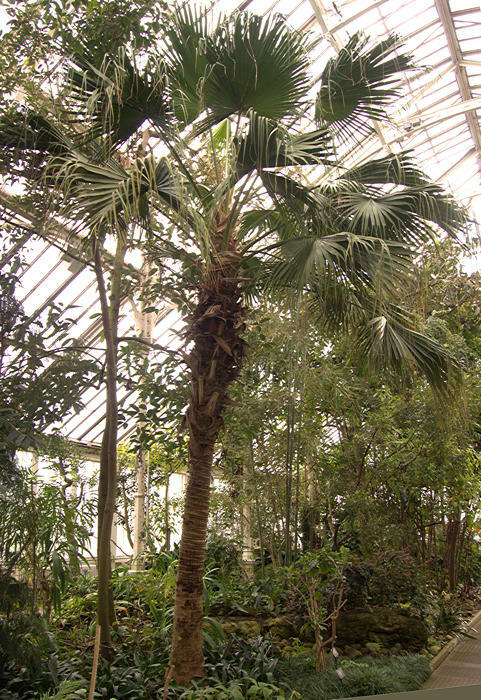 This medium-sized palm tree has a slender trunk up to 10ft tall crowned with a tuft of pinnate leaves up to 4ft long, with up to 100 grey-green 10 inch long leaflets in a single plane either side of the midrib. The underside of each leaflet is pubescent and lower leaflets morph into sharp spines which are more accessible on this short-growing species. The inflorescence is a panicle of small yellowish flowers followed by small, thin-fleshed black drupes. Male and female flowers are on separate plants. Phoenix roebelenii is native to South-Eastern Asia including South-Western China, Laos and Vietnam. This palm suckers freely to form clumps. It is not frost-hardy. This palm tree is very similar to the Date Palm Phoenix dactylifera but not quite so large, growing only 50ft tall. The trunk supports a substantial leaf crown of up to a hundred 15ft long recurved pinnate silver-grey leaves. The lower leaves morph into spines along the petiole. The inflorescence is a 3ft hanging panicle of white flowers followed by purple-red fruit containing a large, grooved seed. The fruit is considered edible. Phoenix sylvestris is native to Southern Pakistan, India and Bangladesh, growing at elevations of up to 4500ft, but commonly on low ground and along river banks. 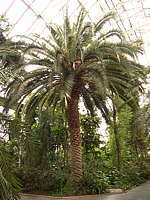 This palm is economically important as a source of sugar. The fruit is boiled to make preserves or wine and the sugary sap is tapped off from cuts in the trunk, drunk fresh or fermented or boiled to make palm sugar (jaggery). Named for: Greek natural philosopher Theophrastus of Eresos ca. 371 - 287 BC, pupil of Aristotle, Father of Botany, who demonstrated how to pollinate the date palm by hand. 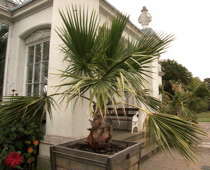 This is a small palm tree with a slender trunk up to 50ft tall, usually suckering at its base. The trunk is crowned with pinnate leaves up to 10ft long with many rigid grey-green leaflets either side of the midrib. The fruit is an oval yellowish-brown drupe containing a single large, grooved seed surrounded by a thin layer of fibrous, acrid pulp. The fruit is eaten by some people local to its natural range. Phoenix theophrastii is native to the Mediterranean island of Crete with a limited distribution in Southern Greece, Greek Islands and South-West Turkey. 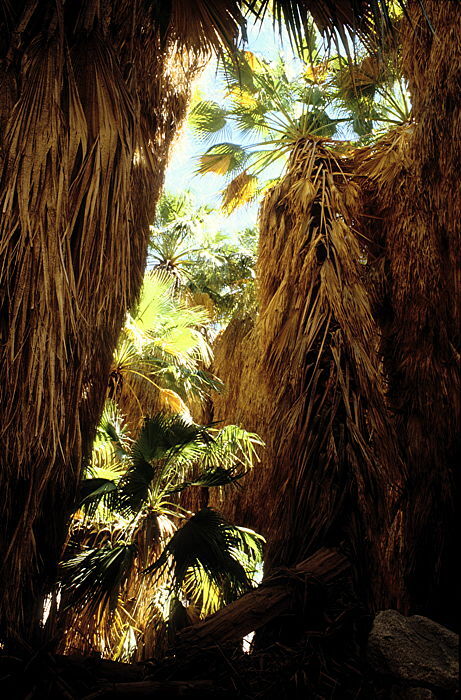 This is the only palm endemic to Europe, forming the only European palm tree forests. 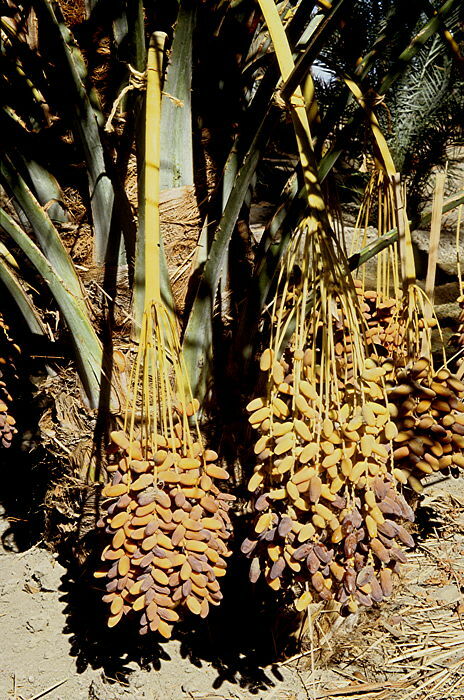 It may be an ancestral form of the edible date palm, to which it is very similar. This genus includes at least 27 and probably more, fan palm trees native to tropical Islands (Fiji, Hawaii, Samoa, Tonga Tuamotus) in the Pacific Ocean. Most species are endemic to Hawaii. 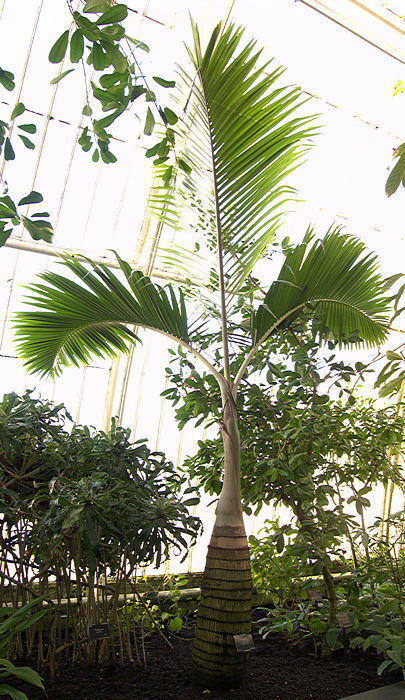 These palm trees vary in height from 20 - 130ft and have fan-shaped leaves with smooth petioles. The inflorescence is a terminal cluster of flowers, in some species longer than the leaves. The solitary, thick trunk up to 50ft tall is topped with a cluster of large fan-shaped leaves on long 3ft, smooth petioles. The leaves are incised into segments, to about a third of their length. The inflorescence is a cluster of hermaphrodite yellow flowers followed by small red fruits, maturing to dark brown. Probably native to humid forests of Fiji and Tongo, but common cultivation as an architectural plant has obscured its exact origin. Not frost hardy but tolerant of salty soils. 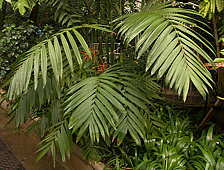 The genus Rhapis includes about 10 species of small, shrubby fan palms, native to South-East Asia. Thin stems up to 12ft tall carry rounded fans of many leaflets carried on smooth petioles. Male and female flowers are produced on separate plants. 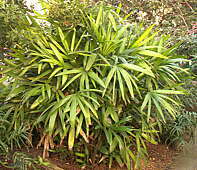 Rhapis excelsa forms clumps of 12 ft stems, spreading through underground rhyzomes and bearing glossy palmate leaves, which are divided into up to 12 longitudinally-ribbed segments with saw-toothed ends. New leaves emerge through a fibrous sheath, which remains attached for a while to the base of the long, smooth, thin petioles and the main stem. When the leaf-sheaths fall a dark green stem, conspicuously ringed with leaf base scars is exposed. The infloresence is a small branching raceme of fleshy pale pink flowers enclosed in a pale green tubular bract, followed by white berries on the female plants. Some clones are hermaphrodites. Rhapis excelsa is probably native to Southern China and Taiwan, but is known only from cultivation. It has been cultivated around Chinese temples since at least the 17th Century and also became popular in Japan. 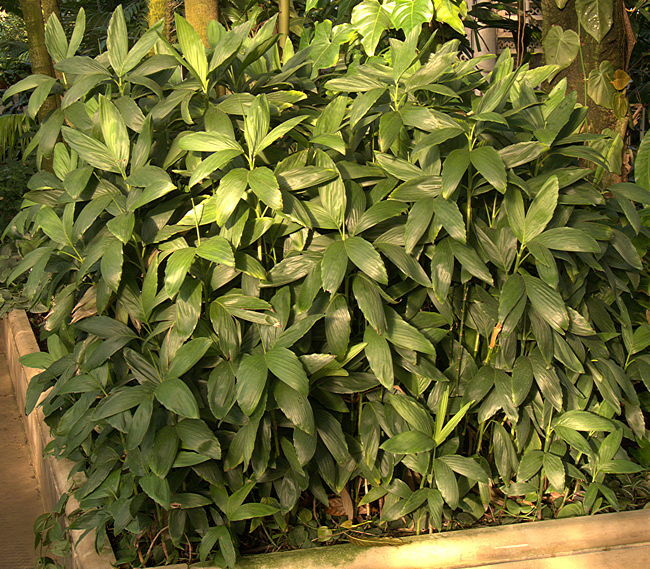 The tolerance of Rhapis excelsa to poor light, low humidity and cold makes it common in shops and offices. It is probably the most widely cultivated member of the genus. Many cultivars including variegated forms have been produced, especially in Japan. 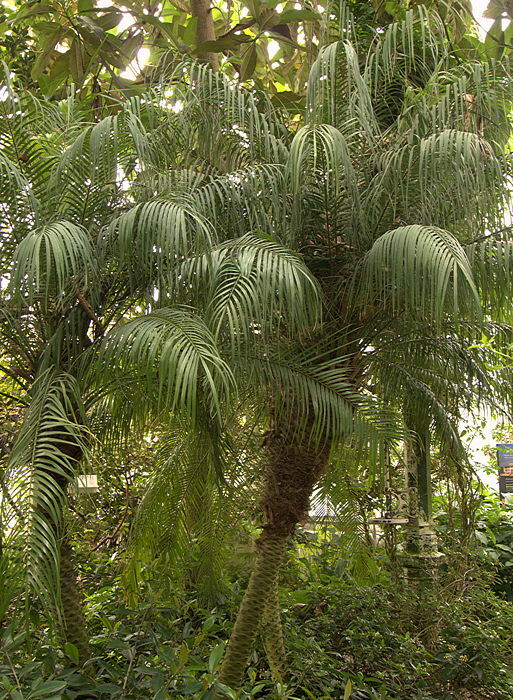 This genus includes 8 species of palm trees native to Asia. Unbranched trunks to 65ft tall are generally covered with fibrous leaf sheafs. The fan-shaped leaves are divided almost to their base into leaflets. The inflorescence is a large branched panicle, hanging among the leaves with small, yellowish individual flowers, probably wind pollinated. The fruits are rounded, bluish-black drupes with a single seed. 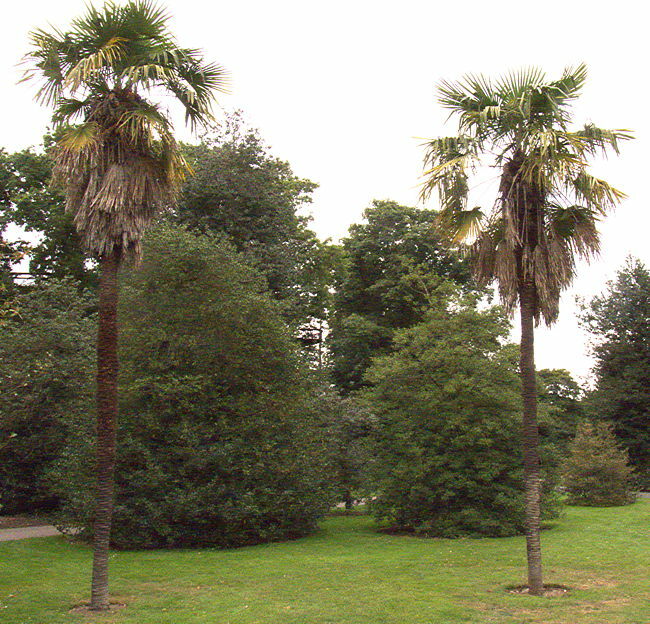 This genus is closely related to the European genus Chamaerops except that Trachycarpus palm trees remain as solitary stems while Chamaerops offsets freely at its base. Named for: Robert Fortune, Scottish botanist who found this species on Chusan Island. This palm tree has a rough, unbranched 50ft trunk felted with persistent fibrous leaf sheaths which insulate it against cold. The coarse, strong leaf-sheaf fibre is valued for making ropes and sacking. Trachycarpus fortunei is cultivated in China and Japan for this purpose, and has been for thousands of years so that its exact place of origin is obscure. The trunk bears a cluster of rounded fan-shaped leaves formed from numerous 3ft long leaflets. Trachycarpus fortunei has long, smooth petioles except for two rows of small spines. This distinguises small plants from the rather similar Chamaerops fortunei which has spiny petioles. The inflorescence is a branched 3ft panicle of tiny greenish-yellow flowers followed by small 1cm blue-black kidney-shaped drupes containing a single seed. Trachycarpus fortunei is native to the foothills of the Himalyan Mountains and mountains of China and Japan at elevations up to 7,800ft, so it is quite hardy. It can be grown in sheltered parts of much of Great Britain and similar cool, damp climates. 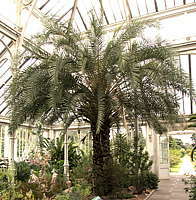 Trachycarpus fortunei is the palm tree most frequently seen in Britain. It is planted in many European countries and across the USA. However, it does not grow well in hot climates. This salt-tolerant plant is suitable for adding a tropical look to coastal gardens and a cool-climate alternative to the less hardy Washingtonia Californian Fan Palm seen planted along many Californian boulevards and beaches. California-blue skies aren't guaranteed to follow planting. 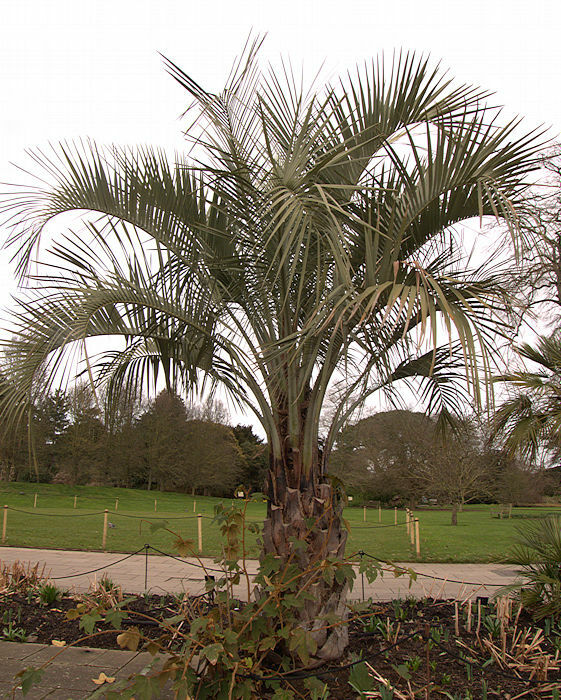 This cold-hardy palm is a more compact version of T. fortunei, but still capable of growing 30ft tall. The dark-green leaves are smaller, with shorter petioles than those of T. fortunei, and have a rounded outline. The genus Washingtonia includes 2 species of fan palm trees native to South-Western North America. The trunk supports a crown of leaves with a bare petiole supporting a rounded fan of many leaflets. The dense inflorescence is followed by small dark brown drupes consisting of a thin layer of edible sweet flesh over a single seed. The fruits were used by native Americans. Washingtonia palm trees have the classic California-look. These are the palms planted along Californian boulevards and beaches e.g. Venice Beach Ca., where their salt-tolerance is a virtue. Dead leaves felting the trunk are a fire hazard and are are usually removed from palms planted in towns. Washingtonia filifera Wendland 1879 (California Fan Palm). 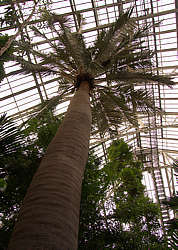 This palm tree can grow a 75ft trunk crowned with many 6ft fans of leaflets at the end of 6ft petioles. Dead leaves persist around the stem providing protective felting against excesses of heat or cold. The 15ft inflorescence has white flowers, followed by oval fruit. 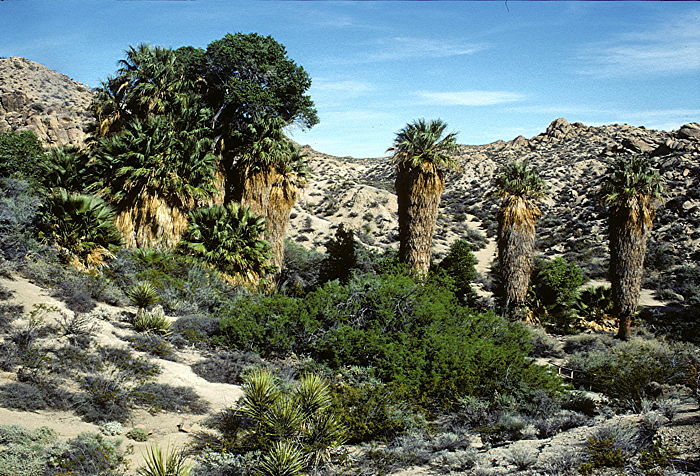 California Fan Palms are found in canyons at the base of mountains, around desert oases and planted as landscaping. 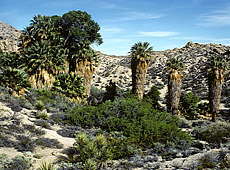 Washingtonia filifera, Palm Canyon, Anza Borrego Desert State Park, California. 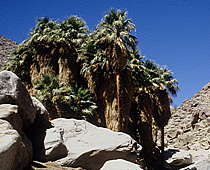 Washingtonia filifera, Cottonwood Springs, Joshua Tree National Park, California. Washingtonia robusta Wendland 1879 (Mexican Washingtonia). 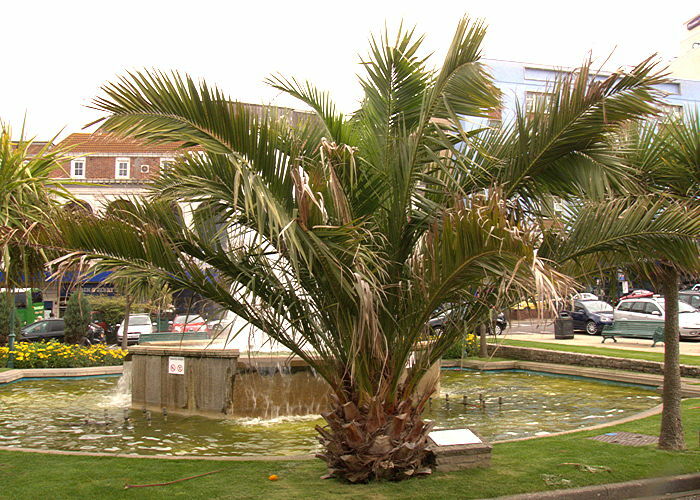 A 75ft palm tree with smaller 3ft petioles supporting 3ft fans of leaflets. The 10ft inflorescence has pale pink flowers, followed by spherical fruit. Native to Sonora, North-West Mexico and Baja California. 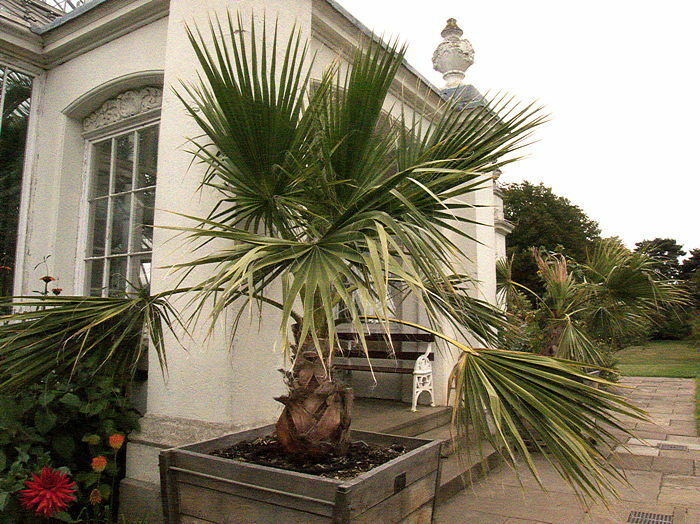 Left: A small Washingtonia robusta outside the Temperate House, Royal Botanic Gardens, Kew, in August 2011. It is taken inside for the Winter.